Tips and Tricks : As soon as the swimmers are out of the pool, he throws tennis balls into the water for a surprising purpose! As soon as the swimmers are out of the pool, he throws tennis balls into the water for a surprising purpose! The pools are ready to welcome their first swimmers, it lacks a little heat so that we can totally enjoy it. The products and the filterer still take time to treat all the water of a swimming pool, it does not happen instantly! That's why this dad a bit doting father and probably hypochondriac on the edges always throws tennis balls into the water once the swimmers come out of the pool. When the weather is nice and warm, we use sunscreen to protect themselves from the sun and we sweat too. When you go into the water, creams, sweat and greasy film rise to the surface of the water. You realize this by watching the water "shining" on the surface, in floating spots. 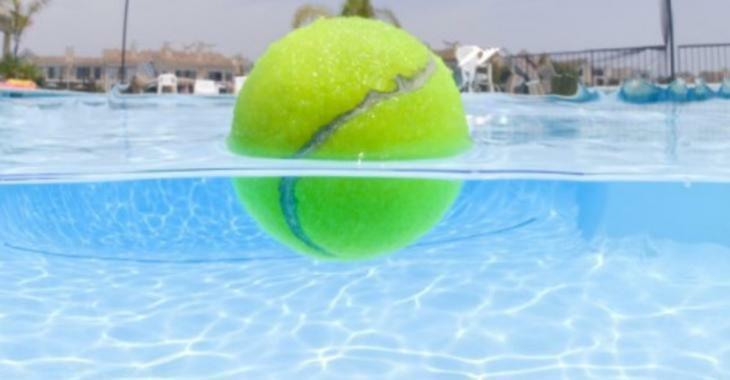 Tennis balls will quickly absorb these greasy film at the surface of the water; both in the pool and the spa! You need 1-2 tennis balls to clean a spa and 3-5 tennis balls to clean up the surface of the pool depending on the size of your pool. *Wash the ball in the washing machine or the dishwasher to get rid of the accumulated dirt.